What is the purpose of your conference? What would make it a success? This comes down to figuring out exactly what your target audience wants. For a conference and its promotion to be a success, this needs to be addressed. Once you have established this, you should then have a clear objective and purpose based on the needs of your audience. Once you have clarified your objective, you need to then decipher which topics and questions your speakers should be addressing. What agenda will help them relate to your target audience best? A capable facilitator is crucial to you’re the success of your sessions or workshops. You will need to find someone who is articulate, agile and has enough knowledge of the topic to ask the right questions. When it comes to selecting your guest speakers, it will prove highly-beneficial if you recruit individuals who have an online presence. Picking someone with the relevant expertise and experience is a given, but the more credible they are the better as this will boost awareness around your event when you start to promote it (more on this later). 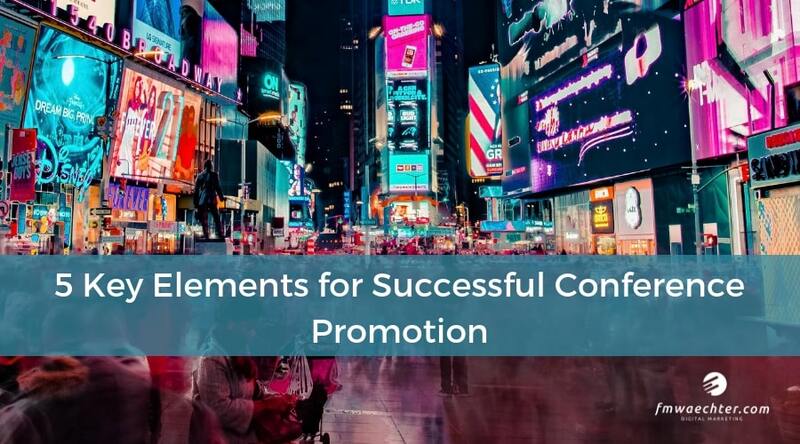 Now to avoid a futile attempt at hosting an event, use these 5 key elements for successful conference promotion. This is the direction online advertising is currently moving in. Incorporating video into your online promotion will result in higher, more responsive engagement. Don’t panic, it can be done inexpensively. Just create a simple interview-style video with your guest speakers highlighting the objective and major topic of your conference. Ensure the mention the value in attending. Thankfully, there are DIY video editing applications that are capable of producing professional looking results and which allow you to work off of templates. All that is required of you is editing the clips you choose to upload. You can even add sound. Email campaigns are very effective for conference promotion. The ROI on email promotion averages at 38:1. Some may say it is a dated method of promotion but the numbers and results state otherwise. Again, there are incredible, user-friendly tools for doing this. MailChimp will allow you to shift all focus on the content. This application allows the user to upload a list of recipients, manage subscriptions and track the open rates. The only real work you will need to do is create engaging content to include in the mailer. You can also send out emails in phases, such as announcing early bird tickets, competitions, surprise speakers and “preparing for the event’ emails. Social media will be your most powerful means of promotion, and when looking to have engaging conversations with your audience, Twitter is the most popular social media channel. You will also be able to leverage your conversations and connections on LinkedIn. You can start by creating a conference hashtag. This will encourage people to engage in online conversations. Use something simple like the acronym of your event name followed by the year. This can be easily monitored. Include the hashtag on all your branding online and on the day/weekend of the conference. This way, when delegates attend, they will utilise the hashtag when posting online. Further to this, look for relevant conversations that your target audience might are engaged in and join in. Offer value in your responses and you will get the right attention. For hashtags specifically related to your conference, conduct a search on Twitter using keywords that are connected to your industry, then join in on those conversations. This method of conference promotion is entirely free, it just takes a lot of effort. Instead of push-marketing, why not instead give your target audience interesting content that they can use and share? Try to establish your brand as a thought leader on specific industry-related tropics. Share information on guest speakers and their influence, insight into the topics they will be covering and why. Be relatable, be valuable. Do not simply promote the price and submission deadline for the conference. Why is it valuable for delegates to attend your conference? Other than industry insight, it is about networking. After you have announced your guest speakers and keynote speaker, ask them to talk about your conference to their own audience. Having someone credible speak about your event will generate invaluable interest leading to an increase in ticket sales. According to Eventbrite, search (Google) can drive between 5-10% of ticket purchases or registrations. You can achieve this by ensuring your pages (landing pages, web pages, blogs) are SEO-optimized. Finally, add the address of your event and embed the google map location of your conference on your pages. If you are unfamiliar with keywords, view this guide. To use keywords to your advantage when actioning conference promotion, you need to discover which key phrases are relevant to your event. Use Google’s Keyword Planner to understand keyword performance, test multiple keywords, and compare keywords to each other. Conference promotion takes a lot of research and commitment. There are many different methods such as influencer marketing and even outsourcing your marketing altogether. If you need expert advice or a proficient support structure, get in touch with me.